Undercover footage from mink factory farms in Ontario, Canada collected in the summer of 2015. "Over the summer of 2015, we visited Willow Pond Fur Farm at 105 Maple Grove Road in Scotland, ON. We documented injured mink with gaping wounds and mink that were too ill to even move. The ground at the farm was covered in feces. Animals were forced to breathe in a toxic odour of urine and feces and did not have access to water. This factory farm has a large waste containment unit at the rear. There is no fence and no other security measures to protect the farm were observed. We also visited Hodgson's Mink Farm at 423 Erie Street South in Wheatley, ON. The mink here are forced to live in cramped wire cages just as at the Willow Pond factory farm - with little room for movement. We also documented the mink being fed rancid food filled with maggots. This industrial scale farm has advanced security with a fence that has a movement sensor, multiple security cameras and guard dogs. Also visited was the Parkinson Fur Farm at 5675 4th Line in Guelph/Eramosa, ON. There were several mink sheds observed but there were no cages and they appeared to have been decommissioned and were being used for storage. The good people of Ontario will not stand for this cruel treatment of animals. Confining animals in horrific conditions where their movement and normative behaviours are restricted, where they are denied medical treatment for severe injuries obtained in captivity, and where they are forced to breathe toxic fumes from their own excrement is despicable and shameful. This perversion of nature must end. We call on the government of Ontario and the Federal Government to enact legislation banning the farming of fur bearing animals and to enact legislation that ALL animals be classified as sentient beings and not as property. We also call on the fur farmers of Ontario to close down your fur farms and find new and rewarding careers that don't profit from the misery of animals. If you don't close these farms, we will close them for you. "Over the summer of 2015, we visited and video recorded Lichty Fur Farm at 5531 Schummer Line in Linwood, ON. We again documented mink forced to breathe in toxic fumes of urine and feces. We documented heaping piles of feces beneath the mink cages that were covered in writhing maggots. They did not have access to water and many looked ill. This farm does not have a waste management system and we documented towering mounds of mink waste and excrement being dumped on the ground at the rear of the farm next to a drainage ditch. The farm has a fence and there did not appear to be any other security. Elm Springs Fur Farm at 5457 5th Line near Guelph/Eramosa, ON was also visited and video recorded. 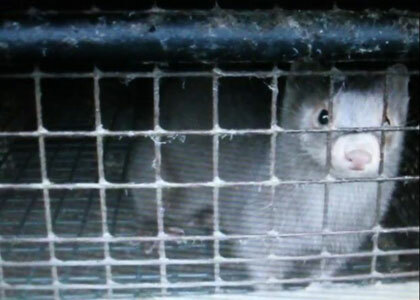 Once again we documented mink confined in small cages with no access to water. The huge waste management container at the rear of this factory farm made the entire area smell like raw sewage and feces. This farm has a fence. No other security was seen. Also visited was Chesterfield Mink Ranch at 696 Talbot Road East in Leamington, ON. This farm appeared to be out of service but could be capable of reopening. We will be checking in later. Anyone defending this treatment of animals must have a sick heart and mind. Mink confined at factory farms like these all over Ontario spend their lives confined in cages that are barely big enough for them to turn around in. They have no stimulation for 24 hours a day. Every single day. And for what? Greed and status? If this footage stirs feelings of sympathy inside you - remember, it is the inaction of the good people of the world that allows violence and injustice to be wrought on those who cannot defend themselves against tyranny. These animals need your help today. "Over the summer of 2015, we visited and video recorded Springbrook Fur Farm at 1561 Berletts Road in St. Agatha, ON, The Jeff Mitchell Mink Ranch at 325327 Norwich Road in Norwich, ON, and The Millbank Fur Farm at 5675 Jones Baseline Road in Guelph/Eramosa, ON. We again documented mink stuffed into obscenely small cages which appears to be the industry standard across Ontario Mink Factory Farms. Springbrook Mink Farm has video cameras throughout the property, a fence, and outdoor speaker alarm system. One security camera was seen at the rear of the Jeff Mitchell Farm. The mink are housed inside a locked? warehouse structure and there is no fence. 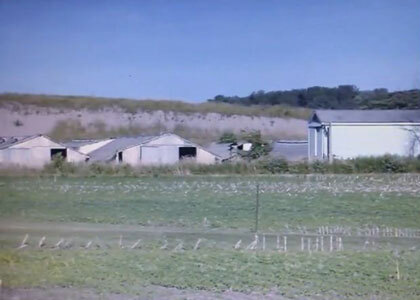 The Millbank Farm has no fence and no cameras were observed. This farm was exceptionally primitive and run down. It almost looked abandoned. The water containers for the animals here were covered in dust and spider webs, indicating that the mink here were being deprived of water for extended periods of time. We felt we had no choice but to release as many mink as possible from this hell hole. We rejoiced as we watched scores of them escape into the surrounding woods to freedom. We have exposed what the fur industry has tried to hide from the public and in doing so we hope that responsible citizens will stop supporting the fur trade and animal cruelty in this province and beyond. We ask activists, community leaders, and anyone with guts and conviction who know in their hearts that animals deserve our empathy and protection to oppose the Fur Trade by any means legal or not.